Some businesses are exploring the service-oriented waters for the first time; others are embarking upon their first service-based pilot program, while others are up and running with a service-oriented enterprise. Regardless of where your business is within this spectrum, Web Age has an education track to fit your SOA (Service Oriented Architecture) needs. If you are interested in following one or more of these education tracks, or if you would like to discuss the development of a custom SOA curriculum for your enterprise, please contact a Web Age Account Executive. What business value does it provide? How can you identify and measure SOA ROI? When is the right time to adopt a SOA strategy? How would an enterprise go about becoming service-oriented? How do you govern a service-oriented enterprise? What is business process modeling (BPM) and how do we take advantage of it? 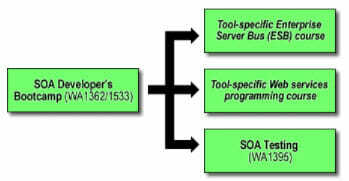 What tools and technologies should we use to implement SOA? 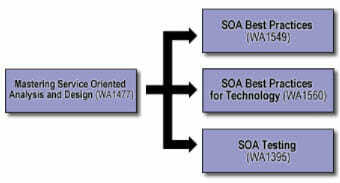 Should we take a progressive, iterative approach, or a wholesale move to SOA? How do you build a service or process? How do you expose existing enterprise assets as services and orchestrated processes? How do you manage and configure services and processes? How do you deploy and test services and processes? How can I refactor my SOA? What are the SOA best practices, patterns, and anti-patterns? How do I get the most business value out of my SOA?